The new collection from Royal bridesmaid dress designer, Nicki Macfarlane, incorporates a beautiful new range of fabrics, silhouettes and stunning summer colours for flower girls and bridesmaids, making her the first choice for stylish brides this year. 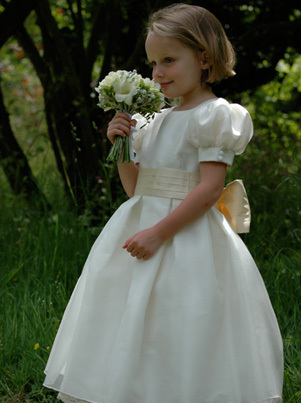 Having designed childrenswear for over thirty years, Nicki has become renowned in the Bridal trade for her exquisite outfits for bridesmaids and pageboys. Headlining the latest collection is the much anticipated Eliza (pictured) which echoes design elements from the dresses Nicki made for The Duchess of Cambridge. This ivory dress features box pleats, a delicate lace trim, buttons on the sleeves and a pleated sash in a choice of colours. Sophisticated, simple and stunning. Other new additions to the ready to wear collection include Grace a delicate lace design, Beth in an exciting new colour palette and Maggie a 50s -inspired, box pleated, sleeveless dress.